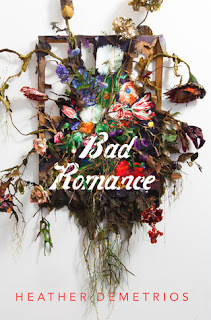 Bad Romance is a raw and realistic look at an abusive relationship. Told from Grace's PoV, after the relationship has ended, the story is told with an honesty and clarity that only comes from hindsight. This is an incredibly important book as it provides an extraordinary look at how love can turn toxic and how unbelievably difficult it can be to escape even if you want to. The ending to this was absolute perfection. I love love love that Grace leaned on her friends, Nat and Lys. The fact that she ended the story with them instead of in another relationship with Gideon (even though he was a great guy) was so incredibly important to me. I believe it's paramount for someone leaving an abusive relationship to surround themselves with support and heal before entering another relationship. The fact that the author took this route filled me with such joy and relief. Bad Romance was an incredible book that I absolutely recommend, especially for teens and young adults. I hope it helps someone somewhere know their worth and that they deserve love and respect. Trigger warnings: clear depictions of abuse, suicide. This could be a painful book for some people, so please use caution.